VanillaTweaks is a Minecraft mod designed to enhance vanilla Minecraft without going overboard. It is designed to be minimally invasive and configurable to create a user experience like none others. For more in-depth review of this i recommend seeing this Spotlight. 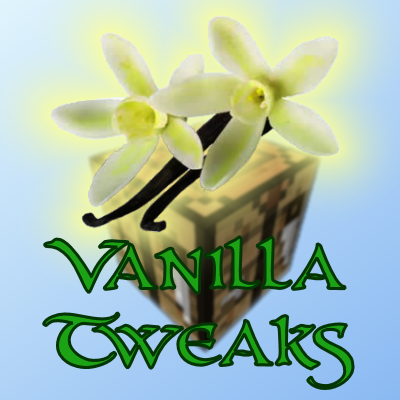 VanillaTweaks is extremely configurable. Everything from enabling and disabling enchantments to zooming can be configured straight from the config GUI, accessible from the mods menu or the game menu. It is advised to delete your config file every time you update VanillaTweaks, for the configuration options may have changed. Check out the Files tab of the VanillaTweaks project for downloads. Is there a bug with this ? as it seems not to sync the settings from the server to the client so the client is able to have different settings as the server, on the server I had stone tools face as we have a different recipe full stop but your mod deletes all stone tool recipes and adds your but if the client is not set to false we still get them in game. This mod is crashing when generating posts from a world using chunk pregenerator :( im using the recommended version of forge. Love the mod and find it very useful! Just a suggestion, could you redo the amount of fences you get as well? 4 planks + 2 sticks should equal more than 3 fences. I will look into it. Thanks for the suggestion. Is the Homing enchantment supposed to drastically drop you bow damage? I was doing like 9-13 damage per shot, I put homing on the bow now I am doing like 3-7 damage. I don't see any option other than enabling or disabling the enchantment? Please help. I created a Github Issue. Any idea how I could possibly revert this? Would disabling the homing enchantment in the config remove it from the bow and restore the damage values do you think? I am scared to test it in fear of losing the item. (It was generated by a mod, and levels up with use). Any suggestions are welcome. So, I was waiting for a reply before starting Minecraft up again, but I got impatient. I decided to give it a try and disabled homing enchantments. I can confirm that doing this does, in fact, remove the enchantment from the bow and restore it to normal damage values. Though I have no idea if it could cause other issues, I sort of doubt it. Please add descriptions to you're enchantments so they work with the EnchanmentDiscription Mod! Released a new version containing support for it. The other enchantments are quite helpful as well. Just wanted to pass that on. Keep up the good work! No probs :) feel free to report as many issue or compatability issues i will make sure to figure out something. Hi, I like the mods very much. However I just found that all the spawners I collected become the basic pig spawner when placed. It does not seem to be spawning any pig too?